"His conduct so disgusted the remainder of the prisoners, including Marcus Favonius, a well known imitator of Catos's, that while being led off in chains they courteously saluted Antony as Imperator, but abused Octavian to his face with the most obscene epithets". Historical figures, especially generals, are much like boxers or sports figures in general. We somewhat remember their glory, but always bring to mind their last attempt at fame, no matter how much it hurts to see the fall of the mighty. If Pompey had died of natural causes right after subduing the pirates, we would find library shelves full of him. If Caesar had survived the Ides only to fall to a Parthian arrow in defeat, would there be that many books about him? Mark Antony, much like many others, lived too long. He has had many books written about him and his last wife, but it is always about Antony the loser. The Gods have not been kind to Mark Antony. The winner always writes the history. So Antony is shown as a love-besotted fool, incapable of anything but obeying Cleopatra. The author is to be commended; he tries to set the historical record straight. 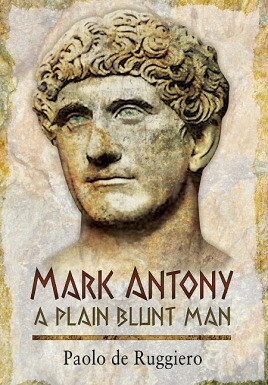 Mark Antony was ruler of half of the Roman world, and he was Caesar's second in command. This is not revisionist history, but just history. You did not become ruler of half the Roman world then because of your name, you had to earn it. Through all of Antony's ups and downs he was respected by most of his countrymen. If he lost to the Parthians, so did many other Romans down through the years. Antony had three wives: Fulvia, Octavia, and Cleopatra. Cleo is the one who gets all the press. I think there should be a larger fan base for Fulvia. The first woman to be on Roman coins, she also led a civil war against Octavian for her husband. She was a firebrand who had helped all three of her husbands to work the Roman mob. "Antony took himself out of the world in a cowardly, pitiful, and ignoble manner, but still in time to prevent the enemy from having their person in his power". "Shortly thereafter, Marcus Antonius, cavalry commander, military Legate, Quaestor, Augur, Master of Horse, Consul, Procunsul, Enemy of the State, Triumvir, last leader of the Hellenistic world, exhaled his last breath between the arms of his lawfully wedded wife, Cleopatra VII Thea Philopater of the house of Lagos." Nice, he is often portrait it as a brute (HBO Rome) but also he was a very capable general and fought their way out to be the ruler of the east part of the Mare nostrum.